Activation: 5-foot candles fluorescent illumination on sign face for 60 minutes. 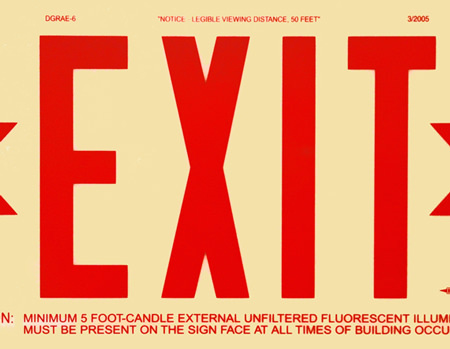 Legible Viewing Distance: From 50 feet 90 minutes after all light has been extinguished. Life Expectancy: 20+ Years depending on wear & tear & environmental conditions. Material: Durable ⅛ inch thick Acrylic. Styles: Screen-printed Red or Green text on Glowing background. Directional Chevrons: Screen-printed or Peel & Stick for field application. Single-face flat surface or bracket mount. Double-face with flag or ceiling mount bracket. Construction: Photoluminescent material bonded directly to All-Aluminum body. 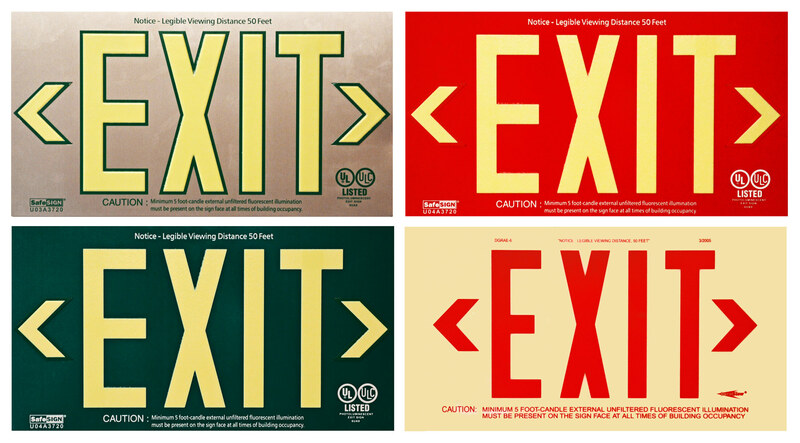 Styles: Glowing EXIT Letters & Chevrons on Red, Green or Brushed Aluminum face. Directional Chevrons: 2 adjustable chevrons included with each sign face. Single-face flat surface or frame mount. Single & Double-face Box Frame with flag or ceiling mount bracket.